According to a new market report published by Transparency Market Research titled “Power Distribution Unit Market – Global Industry Analysis, Size, Share, Growth, Trends, and Forecast, 2018–2026,” the global power distribution unit market is expected to reach US$3,359.0 Mn by 2026, expanding at a CAGR of 6.2% from 2018 to 2026. North America held a prominent share of the power distribution unit market in 2017 and is projected to be at the forefront of global demand. Also, the Asia Pacific power distribution unit market is expected to expand at a significant CAGR. Power distribution units (PDUs) are designed to supply electric power to computers and other networking equipment in data centers. They have multiple outputs and are capable of measuring and controlling the amount of power being distributed. PDU models with high amperage plugs offer multiple low amperage outlets from high amperage outlets. They are installed primarily to ensure reliable distribution of power to multiple devices from a UPS (uninterruptible power source), generator, or utility source. With the increase in number of data centers, carbon emissions and power consumption is also expected to increase substantially. To adhere to environmental regulations, constant monitoring of power consumption is expected to become a necessity. Modern power distribution units with innovative features are expected to help data centers in such situations. Modern PDUs including the intelligent PDUs provide increased uptime, capacity planning, reducing power consumption, real time data collection, and remote monitoring, thereby reducing costs. Rise in data volume leading to increasing demand for data centers is a major driver helping in the growth of the global power distribution unit market. By type, the power distribution unit market has been segmented into basic PDU, intelligent/ monitored PDU, metered PDU, and switched PDU solution. Intelligent/ monitored PDU is expected to be the fastest growing segment during the forecast period. There is a significant rise in the implementation and deployment of intelligent/ monitored PDU due to its advantages over basic PDU such as network grade power distribution, remote/local monitoring, and outlet control. On the basis of power phase, the global power distribution unit market is segmented into single phase and triple phase. By application, data center led the global power distribution unit market. This growth is mainly attributed to the growing adoption of intelligent PDUs within data centers. Also, as the number of data centers continues to rise, demand for power distribution units within data center racks is expected to grow. On the basis of distribution channel, the market is segmented into offline and online modes. Offline distribution channel is expected to hold the largest market share by 2026. 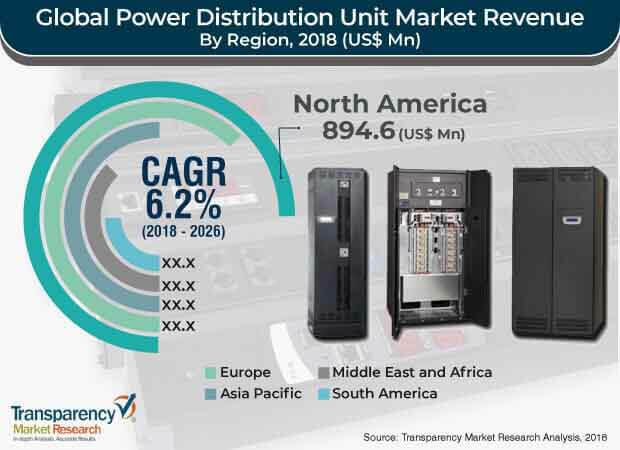 By industry, the power distribution unit market is segmented into data center, telecom & IT, BFSI, healthcare, government, education, retail, utilities, military & defense, and others. Based on geography, the global power distribution unit market has been divided into North America, South America, Europe, Asia Pacific, and Middle East & Africa. North America is expected to hold a prominent share and account for more than 40% of the global market in 2026, followed by Europe. The U.S. power distribution unit market accounted for the largest share compared to the Canada market due to greater spending on IT solutions in the region. In Europe, the rising cloud spending by enterprises of countries such as the U.K., Germany, and France is observed to be one of the major reasons for massive PDU adoption in Europe. As a part of the strategy, several vendors are investing in tools development specific to a particular application and are focused on new product developments, partnerships, and mergers and acquisitions in order to increase geographical reach in the global power distribution unit market. Major players operating in the global power distribution unit market include Schneider Electric SE, Eaton Corporation PLC, ABB Ltd., Cisco Systems, Inc., CyberPower Systems, Inc., Tripp Lite, Leviton Manufacturing Company, Inc., Enlogic Systems LLC., and Legrand SA. These players are focusing on acquisitions and new strategic collaborations in order to increase their market share in the global power distribution unit market. The report on the global power distribution unit market provides analysis for the period between 2016 and 2026, wherein 2017 is the base year, and 2018 to 2026 is the forecast period. Data for 2016 has been included as historical information. The study provides a comprehensive analysis of the expansion of the market during the forecast period, in terms of revenue estimates (in US$ Mn and Thousand Units), across different geographies. The report covers market dynamics including drivers, restraints, opportunities, and trends expected to influence the expansion of the global power distribution unit market during the said period. Technologies that are playing a major role in driving the market have also been considered in the study. The report also covers key industry developments, and Porter’s Five Force analysis which identifies bargaining power of suppliers, bargaining power of buyers, threat from new entrants, threat from substitutes, and degree of competition in the power distribution unit market. Value chain analysis which identifies key stakeholders in the market is covered in the report. The power distribution unit market has been segmented based on type, power phase, application, distribution, industry, and region. The type segment is classified into basic PDU, intelligent/ monitored PDU, metered PDU, and switched PDU solution. The power phase segment includes single phase and triple phase. The application segment includes data centers, commercial buildings (networking) and laboratories (IT/Computer Labs). The distribution channel segment includes offline and online channel. The industry segment includes data center, telecom & IT, BFSI, healthcare, government, education, retail, utilities, military & defense, and others. Geographically, the report classifies the global power distribution unit market into North America, Europe, Asia Pacific (APAC), Middle East & Africa (MEA), and South America; the regions are analyzed in terms of revenue generation. Furthermore, region-wise prominent countries covered in the report include the U.S, Canada, U.K., Germany, France, Japan, China, India, GCC countries, South Africa, and Brazil. Global trends have also been added in the power distribution unit study. Additionally, the report covers segment-wise comparison matrix, market attractiveness analysis, and market share analysis of key players for all regions covered in the scope of study. Furthermore, the report includes competition landscape which comprises market share analysis, market positioning of major players in the power distribution unit market based on their 2017 revenues, and profiles of major players. Competition matrix benchmarks leading players on the basis of their capabilities and potential to grow. Factors including market position, offerings, and R&D focus are attributed to a company’s capabilities. Factors including top line growth, market share, segment growth, infrastructure facilities, and future outlook are attributed to a company’s potential to grow. This section also identifies and includes various recent developments carried out by leading players of the power distribution unit market. Company profiling includes company overview, major business strategies adopted, SWOT analysis, and market revenues between 2016 and 2018. The global players profiled in the power distribution unit market include Schneider Electric SE, Eaton Corporation PLC, ABB Ltd., Cisco Systems, Inc., CyberPower Systems, Inc., Tripp Lite, Leviton Manufacturing Company, Inc., Enlogic Systems LLC., and Legrand SA.